Hey, I thought I'd make a thread for Klangbau Köln discussion, because so far it has been scattered all over various other threads, mostly about the Twin Peak Filter, and it's difficult to find. The way I see it, the modules and their application all follow a certain chaotic (not random!) rhythm and sound generation concept, with inspiration from analog computing, Rob Hordijk, probably a little bit of Serge and more. It's less about making a typical musical pop song and more about soundscape exploration, although Klangbau's oscillators generally do track 1V/Oct nicely. The modules often feature a little something "special", like clever normalisation (e.g. amplitude-to-pitch tracking on the Twin Peak filter and resonator) or an added feature on a seemingly simple and standard module (like the S&H with feedback). Where can I get the modules? What's my connection to Klangbau? Tell me about some of the modules! The Tube VCA was one of the first modules and rather popular, as it was relatively small but used a real tube to add some nice crunch to your sounds. Then there is Klangbau's version of Rob Hordijk's Twin Peak VCF and the new version, the Twin Peak Resonator, letting you create those iconic filter ping and vowel sounds! A small but beautiful module is the Logistic Equation, a chaotic CV sequencer. For a brief period of time, there was also a Klangbau Benjolin. Other modules in the lineup are a new Thru-Zero VCO, the XR-VCO which tracks 1V/oct over 7 octaves, a Wavefolder with two VCAs on board, a VCF with feedback and VC resonance, etc. Let's hear those things in action! Alright, let's talk! Who else has some Klangbau in their racks? LogGleichung or LogEquation is an algorythm borrowed from Biolocy. It describes up and downs of two populations. See diagram from flx, it is called "Feigenbaum diagramm". It has a limit and unpredictable phases. The random part we use for our module. Becaus it is chaotic it produces selfsimilar results. I call it melodies, because it is not radically random. At the moment we are developing a real analog version, with more live inside. Because it is a module that calculates, it is an "Analog Computer" device with a real S/H for feeback. See Doepfer´s page and look at patch samples. You can try to patch it in your system also, luck. nothing too musical, but it shows that you can get some great pings out of this filter! so thank you klangbauköln for this perfect modul! received a second twin peak filter from klangbau köln. these are beasts! i did a little Epoch Twin Peak vs the Klangbau Twin Peak filter sound comparison. From 0 to 3:45 i'm filtering a square wave from the Sputnik Oscillator through the Klangbau then through the Epoch. from 3:45 to 8:40 i'm using only triggers from Mutable Instruments Grids into the audio inputs of the filters (and multing to mod a and b of the Epoch). Here, the Epoch is panned hard left and the Klangbau hard right. from 8:40 untill the end, it's back to the sputnik square and some random wiggling of both filters at onece, still panned hard left and right. Recording is completely dry, no effects or eq. In this demo, i'm using animodule line amp as a buffered mult to split the signal going into the audio input of the epoch to also go into the peak a and peak b mod inputs of the Epoch. This is because this is similar to how the Klangbau's Tr-F1 adn Tr-F2 controls are internally wired. I am using channel two of the line amp to boost the output of the epoch because it tends to output below standard euro modular level. line amp helps boot it normal euro levels. The Epoch requires more patching for this comparison but it also has more cv inputs for modulation and is a little more flexible under cv control and is easier to fine tune with it's knobs compared to the Klangbau's joystick, which make it hard to dial in two specific filter frequencies to track with other oscillators and v/oct, although the joystick is nice for improv and performance . you might notice that the Klangbau sometimes has a little clipping or distortion. from my experience this is part of the character of the the Klangbau version, which can sound nice! it can be controlled to some extent with the input level knob. The Klangbau will consistently self resonate with the resonance all the way up, so it is capable of longer sustaining rings . the Epoch does not self resonate like this without modulation/pings. The Klangbau Twin Peak Resonator has a hot output and sweet saturation close to full CW input. keep in mind the input attenuation knob on the klangbau in that video is only at 1 or 2:00. when its all the way up, it can definitely become a lot more gritty and overdriven. i prefer the klangbau, to me its bolder, thicker sounding and has stronger resonance. watch/listen to more demos. the way it sounds should be the most important factor, more so that cost and panel layout, imo. i always like to share this set of klangbau twin peak demos/tracks because these are what sold it for me originally and uzala is amazing.! it is very loud indeed but really nice sounding. the sine is not sterile clean but sounded great in any FM context, the pulse with pwm is great too. the waveshaper was pretty similar to the STOs but i actually liked the klangbau better! I just placed an order for two röhren VCAs yesterday. I love the raw look of his modules. I've had the joystick twinpeak for a weeks now. It sounds absolutely incredible and liquid. One of the best sounds modules I've ever owned for sure! Looking forward to future designs from him! Great explanation on the LE. Some years ago I managed to get the Doepfer patch example up and running. It was fascinating as it just seemed to jump into life once I got all the settings within proper range. I really need to check out the new Thru-Zero VCO. I already got a demonstration and it might work really well together with the nicely FM-able XR-VCO. Twin Peaks Resonator as sound source (I did that "Twin Peak Resonator Band Pass" video as well). Some more jamming on the all-Klangbau system. Besides the brilliant sounds, just want to say that the Twin Peak Resonator is the best built module in my system. Its built like a tank and it oozes quality. Is the twin peak resonator the same filter core as the twin peak filter? Aside from the controls, are there any other differences? I've got the newer Resonator and there are a few differences. -Instead of the joystick there are two separate knobs for frequency of each filter. -There is a knob to make filter 2 FM modulate filter 1. -And a knob to go from bandpass to low pass. Only filter 1 works in lowpass mode. The addition of FM at least adds a lot of possibilities. I only wish there was CV control for this. This is one of those knobs that you end up playing a lot with while playing. The Joystick version's resonance is a little stronger, self resonate stronger/more intense. The joystick version is also capable of a little more aggressive overdrive/saturation imo. Klangbau even stated that in the resonator has some circuitry changes that cleans up the overdrive that the joystick one has. so, to me, they are different enough to justify having/keeping both! Thanks for this. Have been trying to decide which would be better for pinging/percussion. this track uses both twin peak versions i have. Interesting to hear that there are such differences between two same modules. Someone mentioned that they like to use the non-joystick Resonator to filter VCO's, but I find mine quite tricky in those kinds of workcases – sometimes a millimeter makes a huge difference. My Resonator is an awesome sound source (pings, etc) though! It has an impressively large range of possible sounds. I wish there was more information available (demos basically) of some of the Klangbau modules. 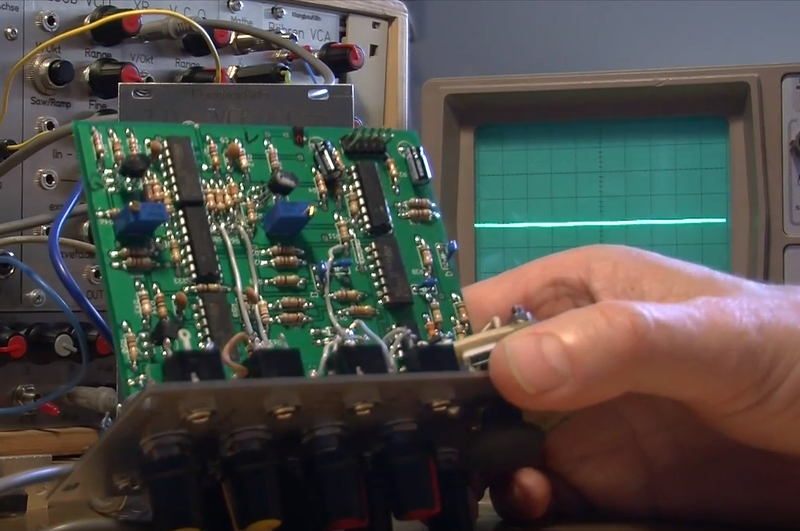 There's stuff like the Thru Zero VCO, the XR VCO, the Wavefolder which do have their own webpage, but there's only a pic and a couple lines of text. That's why I made this thread. Hopefully we can pool some information here I bought an XR-VCO a few years ago (the big version) and I'll see if I can do a demo. The TZ VCO is brand new and I haven't played with it yet. I did get a demonstration though and it seems to do FM really well with the XR. Been eyeballing the Twin Peak filter for a long long time. Only reason why haven't ordered one is because it's 60mm deep. Impossible to fit in a travel case.